“For my Replaced-Brno-2006 project I chose five performances by five artists that took place in Czechoslovakia in the 1970s and 80s. The main selection's prerequisite was that the performances were conducted (or could have been conducted) in a public space. Instead of composed, clearly identifiable performances, gestures or acts that bordered on normal behaviour suited my plan. I was interested in what way a public space and everything related to it (politics, urbanism, architecture, as well as social conventions and rules related to certain places) was transformed. 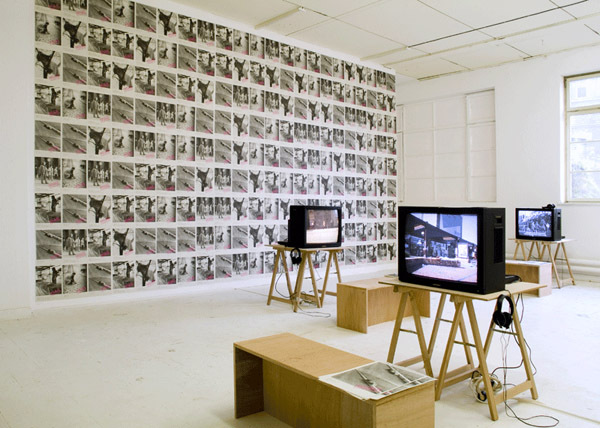 The works of the Czech artist Barbora Klímová (born 1977) have dealt with urban, public space, its history and transformations, as well as the previously almost unwritten history of performances and actions in the ČSSR of the 1970s-80s. Through various materials in the following we would like to introduce one of these projects, Replaced - Brno 2006. It forms the exact interface of the artist's two interests. She understands her reenactments of public actions from the 1970s and 1980s as a "creative investigation of a broader context of artistic and political action in public spaces." (See interview below) Thus it concerns the investigation of the transformation of public space as well as the manner of dealing with it. It also has to do with the question of how the appropriation of historical material and how conversations with the actors from that time can make contexts distinguishable and differences visible. 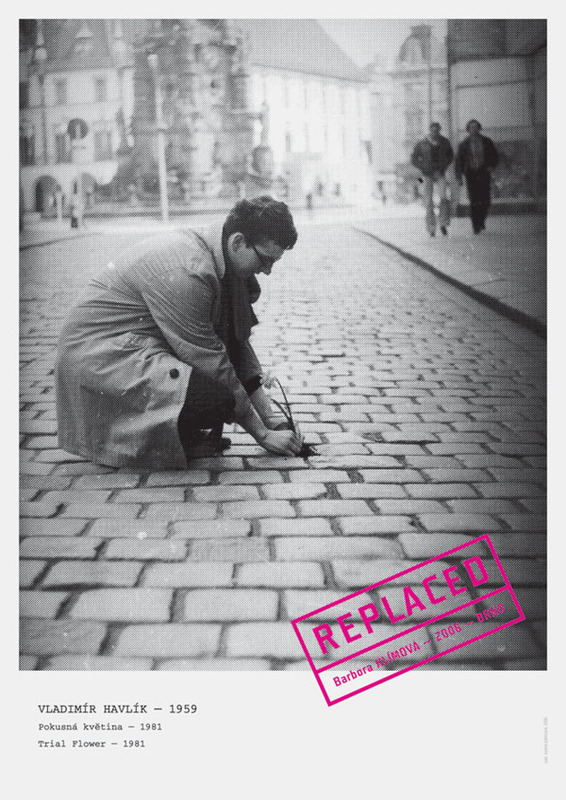 Replaced - Brno 2006 was Barbora Klímová's first project dealing with aspects of the history of the 1970s and 1980s and was based on extensive research. She presented it at Manifesta in Rovereto in 2009. The conversation with Adam Budak, one of the curators of Manifesta, occurred in this context. Here we are interested in the process of investigation, the performances in public space, as well as the form of recording and presenting this process in the context of an exhibition. To what extent can reenactments of past actions provide tangible access to the history of performative art forms? How can they render the undertaken transformation visible? Klímová's artistic contribution to the appropriation of recent history reveals the political dimension of this work in a subtle way without any explicit references. Her projects combine the investigation of the historical dimension of places, architecture and cultural practices with the artistic transformation of its results. In this process she refers primarily back to the era after the suppression of the Prague Spring, the era of so-called ‘normalisation’. 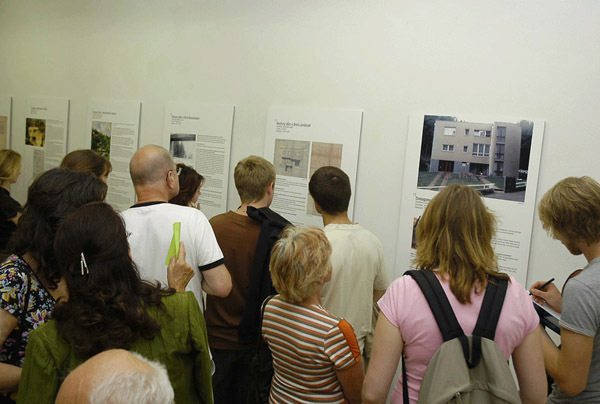 In 2007, the project Famous Brno Villas II, for example, went into the recent history of individual construction in Brno. Brno is not only the city where Klímová was born and currently resides, but is also renowned for its buildings from the period of "white modernism". The Tugendhat villa, which Mies van der Rohe completed in 1930, is the best-known example from that period. In her project, Klímová investigates who planned and realised the single-family homes in Brno in the 1970s and 1980s, as well as the conditions under which this occurred and with what architectural ideas and conceptions. She thereby also reacts to the successful exhibition Famous Brno Villas, which took place in 2006 and which regarded the time period that she had just investigated as being unproductive and had excluded it from the interpretation of history. Klímová's documentation, which consists of photos, plans and current interviews of the villa's builders, demonstrates not only how much Functionalist and Bauhaus architecture was the point of reference, but also how these construction projects could only be carried out with great difficulty. The following materials (interview, quotes and images from the artist's website) provide a glimpse into the artist's work on and the presentation of Replaced - Brno 2006. 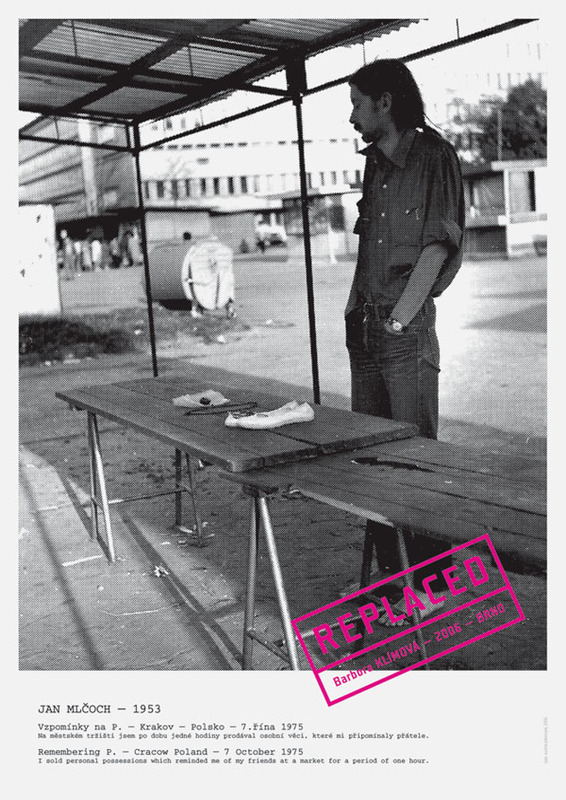 The following conversation between Adam Budak, curator of Manifesta 7, and Barbora Klímová took place on the occasion of the presentation of her project Replaced - Brno 2006 at Manifesta 7 in Rovereto in 2009. Budak and the team of curators had placed this part of the Manifesta exhibitions in the context of a critical regionalism under the title "Principle Hope" (cf. http://www.manifesta7.it/locations/show/). The conversation was first published in the online magazine ARTmargins. Adam Budak: Let us begin with the origins of Replaced. This installation somehow differs from your previous work, which was mostly concerned with space and architecture in a more subjective way. Replaced, on the other hand, has more of a political dimension, does it not? 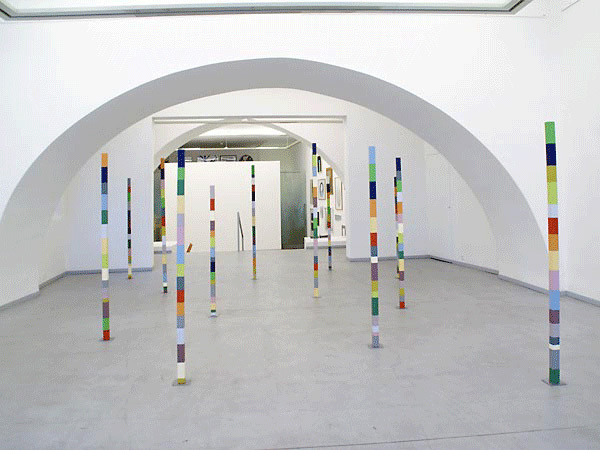 Barbora Klímová: The REPLACED-BRNO-2006 project truly marked a shift in the direction of my work. I studied at the Faculty of Fine Arts in Brno. The work I created during and immediately after the completion of my studies reflected spatial aspects of my environment, which was probably important to me insofar as it symbolized belonging to a certain generation. At Brno, I emphasized the prefabricated architecture of the '70s and '80s, the urbanism of that period, and the legacy of functionalism. I worked with objects and installations that paraphrased architectural elements as well as with constructivism, modernism, and minimalism as fine art disciplines. While I was attending the postgraduate studio program at the Hoger Instituut voor Schone Kunsten, Higher Institute for Fine Arts (“HISK”) in Antwerp, I gradually lost confidence in the representational and aesthetic level of art. I tried to get involved in the field of architecture and urban planning. I was only interested in the planning process, not wanting to deal with putting on the finishing touches. When I later studied urban theory which is highly developed in the Netherlands and in Belgium, I became conscious of the extent to which my experience was inseparable from the Czech environment whose history is completely different from that of Western societies. I realized that none of those urban theories fit the Czech context completely. That was when for the first time the need to reflect the specificity of the Czech context arose in my mind. This coincided with my study of Czech performance art of the 1960s to the '80s. Generally, I felt the need to go beyond the mere representational level of art, to direct my attention towards the creative investigation of a broader context of artistic and political action in public spaces. 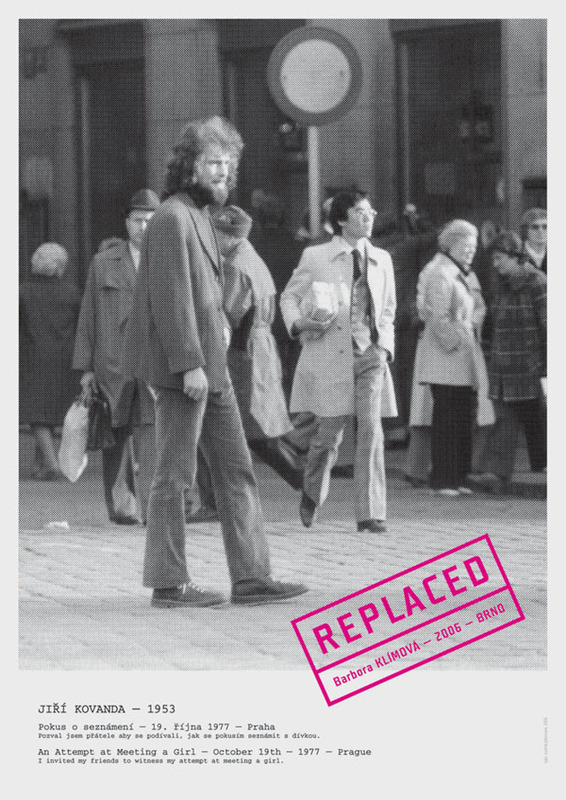 Replaced is important for me as the point at which I discovered art‘s potential to influence or intervene in the broader social context. A.B. : How do you define public space? What criteria did you use when selecting particular performers and performances? B.K. : REPLACED-BRNO-2006 relates to a rather idealistic understanding of public space as a place where the individual and the collective meet. In this interpretation, public space is open to everyone and encourages a confrontation of divergent social groups. Its primary content is confrontation, interaction, and transition. It is defined by rules that are accepted within a particular society, such as morality, security, and so on. Apart from investigating the notion of space at various times and in different political circumstances, the project explores the current (non-)existence of public space in the Czech Republic. From archival materials documenting performance art during the past four decades in the Czech Republic, I selected those pieces in which the artist was confronted by random passers-by. I tried to avoid any theatricality in my selection of performances. My selection included borderline gestures, acts or behaviors that could be considered less than “normal”. By reenacting the same performances I had found in the archives in different locations, I attempted to test the way in which certain conventions and rules relate to certain locations and are projected on the behavior and actions of its inhabitants. A.B. : How was public space perceived differently under Communism and after the fall of the Berlin wall? B.K. : My conversations with the original performers illustrated the various perceptions and perspectives of different generations. For all of the artists I interviewed, the period from the '60s to the '80s in Czechoslovakia represented a time of cultural starvation on all levels of the society. From their point of view, it was a period that was hostile towards the expression of personal opinions or any form of interaction. The work of these performers is closer to American performance art than to the events of the Prague Spring. The oldest of these performers, Karel Miler, mentioned to me that in the early 1970s – after the Prague Spring and the Soviet invasion - there was greater fear of being arrested for non-political/slightly unusual activities in public than during the gradual easing of restrictions in the 1980s. He recalled that one could have easily been arrested for burning a piece of paper on the street. The younger performers concentrated instead on the apathy and incommunicativeness of the public and on their own desire to stand out from the crowd. With the exception of Jiří Kovanda and Vladimír Havlík, all of the artists rejected any interaction between them and the public during their performances. Kovanda's performances were only addressed to a few informed spectators who had been specifically invited for that purpose. The invited spectators knew that they would witness an artistic performance, while random passers-by did not. In theory, then, the first group might have observed the reactions of the second - if there were any. It is altogether unclear if these performances were directed at the public in the street, or not. Most of the unofficial cultural events at that time were organized by word of mouth. They could not have been officially planned for an anonymous crowd. This is probably one of the reasons for the subtlety of Czech performance art of 1970s and '80s. It may also be the reason why some of the artists involved never did any performances outside of urban space. Several of the performances took place in cellars, attics, and state institutions such as the National Gallery where some of the artists were employed. They managed to produce some of their performances illegally at night, or after working hours. Of course these performances were dedicated to a group of friends. I became fascinated with the way in which culture takes shape in restricted conditions and subsists on the regime’s weaknesses. The weakness of the institutions and its norms is especially interesting when we consider the current situation in the Czech Republic and the state‘s efforts to reform its institutions. The driving force behind my reflection of urban space in a post-communist country was my personal experience as an artist born in the '70s. I grew up during the gradual release of restrictions during the 1980s. I experienced the euphoria related to the change of the political situation in 1989 and the subsequent transformation, succeeded by privatization and the vanishing of the intensity of urban spaces. I recall the period of the 1980s with a sense of nostalgia. And the experience of the '90s is crucial to me. I wanted to reflect on this experience when I placed the performances I found in the archives in the context of a completely different reality. First, I wanted to address the apathy that is a result of the over-saturation of urban space with commercial stimuli and the way in which these were replacing the apathy and indifference that had characterized the public during the '70s and '80s. In some cases the public reacted with indifference to my interventions, treating them essentially like sales pitches. The public generally associates live events in the street with homelessness and/or socially marginalized groups. This was illustrated by the (non-) reaction to my remake of Karel Miler’s performance Either/ or – Prague – 1972. I lay face down on the ground in various places but no one showed any reaction - except for one who called an ambulance without even approaching me. I also sought to challenge the focus of the practice of surveillance that is so widespread in public and semi-public space. For example when I planted a flower (a remake of Vladimír Havlík’s Trial Flower – Olomouc – 1981) in front of a bank, a security guard came to me and lectured me on how dogs urinate on the trees. I am skeptical when it comes to the existence of public space in today’s Czech Republic. The culture of the public realm that emerged in the 1990s has withered away. And it looks as if in our country there is not enough of a continuous tradition of such a culture. Most of today‘s so-called public spaces are commercially used or utilized as places of transition. The relics of monumental open space and the architecture of the 1970s and 1980s are vanishing, often replaced by faceless commercial architecture. In that sense, I see great potential in the collaboration between architects, urban planners, theoreticians and artists in the re-activation of public space. A.B. : How do you as a representative of a very young generation of Czech artists relate to the legacy of the artists you chose for your project? What was the biggest difficulty in restaging these performances? B.K. : My reenactments served as reflections on social transformation and the shift in the way in which we view these performances today. I am not so interested in questions of originality and authenticity with regard to performance as a medium. But I have to admit that the the project does touch on that concern. It also touches on questions of gender, which I did not really anticipate. The fact is that I could not find any female performers active in the 1970s and'80s, so I was forced to use only performances with male protagonists. The artists with whom I worked on the project abandoned performance art in the '90s for personal and political reasons. Performance simply lost urgency and relevance for them. This can be related to a certain exhaustion of the medium. With some exceptions, most of the former performers do not consider themselves artists anymore. I on the other hand consider them the classics of Czech art. I appreciate the fact that they decided to put an end to their careers at a point when art lost its urgency for them. What I found most difficult was to communicate with some these artists. In some cases there were misunderstandings as a result of our different generational experiences and their decision to back away from public life. One of the artists (Petr Štembera) even refused any form of contact. I do not censor him or any of the other artists for this refusal. It needs to be viewed within the context of the 1970s and '80s when these people invested a great deal in their art - without any palpable return. So now some of them are disappointed and simply want to be left in peace. So all this became part of the project and what it has to say about the dialogue between different generations. REPLACED – BRNO – 2006. Vladimír Havlík, Trial Flower, Olomouc 1981. REPLACED – BRNO – 2006. Karel Miler, Either – or, Prague 1972. REPLACED – BRNO – 2006. 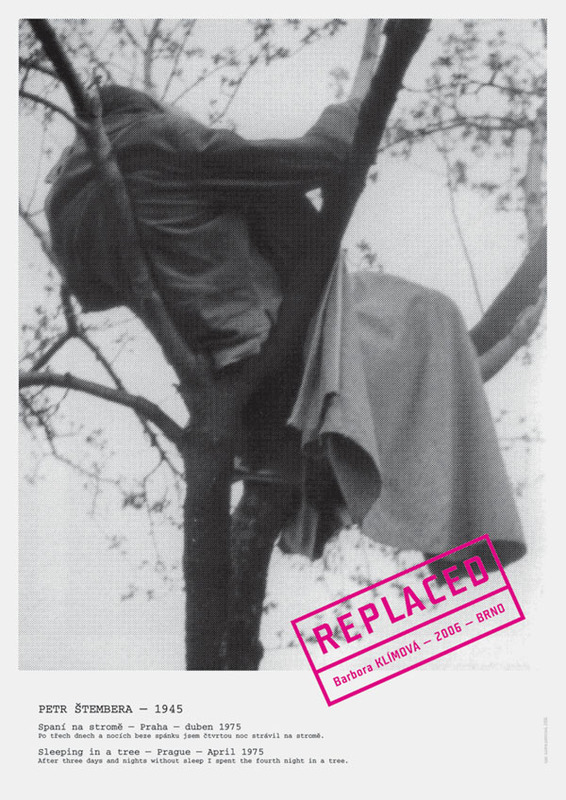 Petr Štembera, Sleeping in a tree, Prague April 1975. After three days and nights without sleep I spent the fourth night in a tree. These three aspects are fundamental parts of Klímová's work in this and other projects. 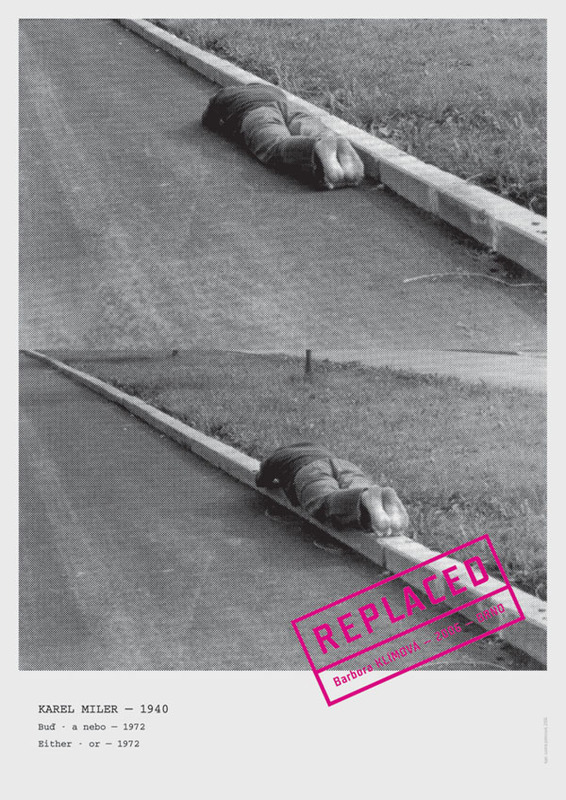 Archival research is the first step in the inspection of an area, in this case of the performances and actions in public space of the 1970s and 1980s, and it led her to a decision on the selection of the historical examples. The second step was interviewing the artists of these actions. Barbora Klímová explains both steps in the following quotes taken from another interview from June 2009. “Most Czech performances of the ’70s and ’80s were documented in written and photographic form. Rarely are there any video recordings, mainly because of the general unavailability of this medium. If I wanted to find out about the context, the reaction of the random passers-by in the ’70s and ’80s, when the performers recorded their actions, I had to meet them and question them. These interviews then became an integral part of the work. The performances of the ’70s and ’80s became icons of Czech cultural history, especially in conjunction with the general interest in unofficial culture in the years immediately following the revolution in 1989. But nevertheless the individual aspects and contexts of their genesis haven’t been analyzed yet. From the interviews and confrontational performances in modern times, a whole range of facts, happenings and circumstances occurred which I hadn’t picked up from the photographic documentation. It illustrates i.a. the transformation in the way in which we look at the documentation of the performances of the ’70s and ’80s today. Archival research and investigation through direct communication with the actors of that time were followed by reenactment at another location - transformation in time and place - and examination of these shifts. Klímová's reenactments - she had settled upon this (see above) - do not occur as publicized art events, but rather are witnessed by random passersby, without a frame as it were. How is that which occurs there, and which is shown, in turn to be documented, or simply transformed into a different medium, so that the events can be communicated in the framework of an exhibition, in the context of art? Klímová chooses to film the actions with a hidden camera in order to be able to include a view of the reactions of the passersby. Her presentation of the project on the website, as well as in the context of the exhibition and catalogue, integrates various media formats. The aforementioned posters use the uniformly screened photos of the historical actions and refer to the work in the archives. The four to six minute cuts from the film documentation are accompanied by audio from the interviews, so that different perspectives are brought together audiovisually.